Sort your dog's storm anxiety with non-sedative relief. If your dog struggles with storm or loud noise anxiety you are unfortunately in good company. So many Aussie dogs fall into a complete panic when storms hit. The good news is that you may be able to sort out this issue without resorting to sedatives. Does your dog display storm anxiety symptoms? Fearful behaviours such as shaking, panting, drooling, fear, hiding, and destructive behaviour can all be helped with Storm Stress. 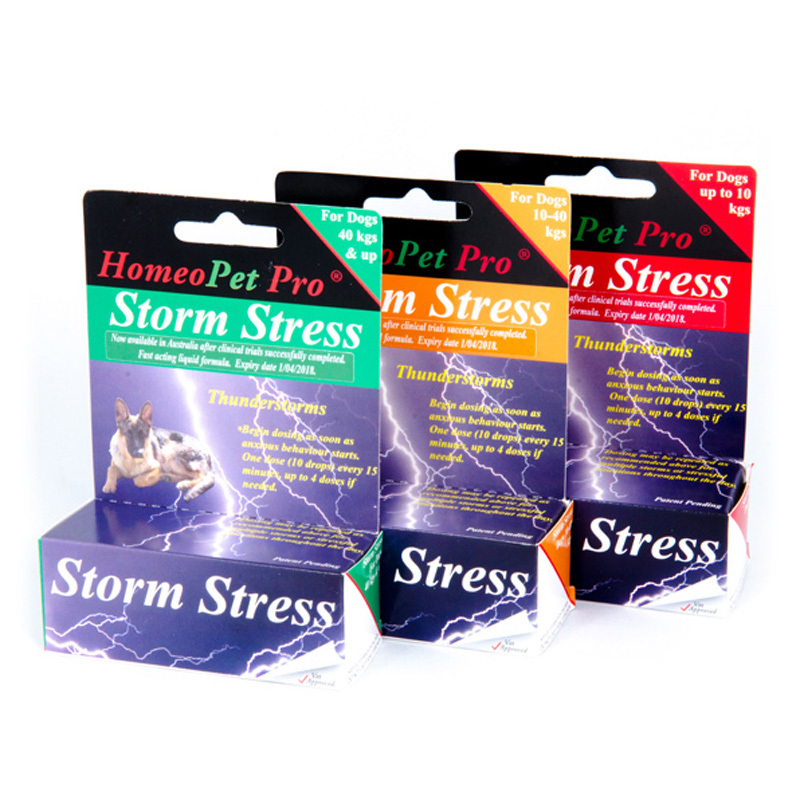 HomeoPet Storm Stress is a vet formulated solution which calms dogs experiencing fear of thunder, fireworks or loud noises. Leading Australian behavioural Veterinarians Dr. Seskel, Dr. Ley, Dr. Blackman and Charles Sturt University conducted major triple blinded trials that show significant results in reducing dog storm phobia. Just administer a few drops of this natural liquid solution and your dog may see excellent results often within 15 minutes. For general anxiety issues, you have a look at HomeoPet Anxiety. Deadly Nightshade (Belladonna 30c): useful for normally quiet individuals and those very sensitive to the flash of lightning causing terror with dilated pupils, even aggression. Borate of Sodium (Borax 6c & 30c):helpful for fear of any sudden noise or any loud noise. Drooling is often a symptom. Super alert animals, like rabbits, with trembling whiskers as it sniffs the air for predators. Calcium phosphate (Calc Phos 30c & 200c): alleviates fear of thunder, and will shake, tremble and bolt during a storm. Yellow Jasmine (Gelsemium 6c & 30c & 200c): used for anticipatory anxiety with trembling and the paralysis from fear. Helps with diarrhoea or involuntary urination under extreme stress. Flint (Silica terra 30c & 200c): helps dogs strongly affected by changes of weather, noise and light as in storms, hurricanes, thunder, lightning and fireworks. Jimson weed (Stramonium 30c): assists with terror with the wide-eyed look of fear that can lead to aggression. Helps dogs with a strong fear of the dark, re-homing or abandonment. Valerian Root (Valeriana 7x & 2c): helps with hysteria with over-sensitivity, more so when alone in the dark.